Google's Nexus 4 mobile device went on sale for about a minute or two yesterday in the U.S. before selling out. It was a joke, I personally tried to add it to my cart and I did it the second the item was available for purchase and it timed out. It sold out in minutes, I have no clue how many Google was able to sell or how many they had in inventory to sell - but it didn't seem like many. A forum filled with complaints can be found in the Google Web Search Help forum, I am sure there are other threads there and other forums with complaints. 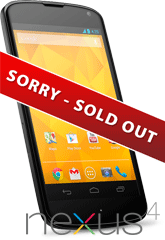 As many of us may have realized, Nexus 4 was sold out in nearly every country within 30 minutes of it being launched. I am in Germany and I wasn't quick enough and could not buy it. My question is, when will it be available again? I was really looking forward to this phone, but did not realize that there were many like us, or was there not enough devices? Did Google wrongly estimated the demand for Nexus 4? In any case, I am disappointed and I sincerely hope that the phone becomes available again soon. Right now if you want to order it, you cannot. It says sold out. It won't even let you order it to be in a queue when the inventory comes in. So when will Google replenish and open up orders again? Who knows. I seriously wonder how many devices Google had on hand.